When a master sword-maker adopts the son of a murdered friend, the boy (Chiu Man Cheuk) learns the master's craft well. As a young man he learns of his father's death at the hand of a mysterious tatooed killer (Xiong Xin Xin). He takes his father's broken blade and sets out to seek vengeance. The sword-maker's daughter, Ling (Song Lei), follows but is caught in a bloody ambush. When he tries to rescue her, his arm is hacked off in battle and he is believed dead by all except Ling and his friend, who set out in search of him. But he is saved by a hermit girl who nurses him back to health, and it is in her house that he finds a old kung fu manual and practices with the broken blade to perfect the art of one armed sword fighting. In this respect he does and he does not succeed. Personally I really like this film, and just as I was starting to write this review, I put on the start just so that I could remember a particular thing about it, and I found that I could not turn it off. 30 minutes later I generated enough will power to switch it off so that I could concentrate on writing what you are reading now... However, as good as I think the film is, I don't think it quite reaches the epic proportions which were originally hoped for. Ok, the plot. The film primarily follows three characters, two male and one female, and focuses on the relationship between the three. The two men work for a master swordmaker, and the third is the swordmaker's daughter Ling. She has a crush on the two men, one of whom is acted by Chiu Cheuk, and she wants things to develop so that the two would fight each other for her, but things do not go the way she plans, as the two men are good friends. Chiu Cheuk is an orphan child, and was taken in by the master sword-maker as Cheuk's father was the sword-maker's good friend, but was killed in a battle with a tatooed killer. This happened when Cheuk was a small boy, but when he reaches young adulthood he learns of his father's fate and sets out to seek vengence. 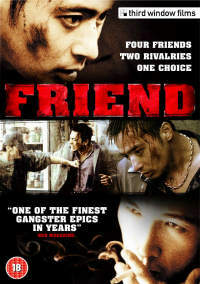 Ling follows him, but is caught in an ambush by a group of killers. In a rescue attempt Cheuk's arm is hacked off, and he is thought to have died in the same fight. However, he was nursed back to health by a hermit girl, and it is at her house where he finds an old kung fu book for swordfighting, and he begins practicing his new kung fu style of one armed swordplay. From there on, there are lots more fights, Ling and Cheuk's friend refuse to believe that Cheuk was killed and so they keep searching for him, and Cheuk continues his quest for vengence for his father's murder. On the surface The Blade has a plot like most other martial arts films. Man finds out his father was killed by a bad guy. Man goes out to take revenge. Man gets beaten up and loses fight. Man goes away and trains exceptionally hard. Man comes back and wins. It is an old tired formula which you will likely have seen hundreds of times before. Fortunately in The Blade that part of the story is handled very well, it does not become boring or tired at any point, as what realy adds to the story is the relationship of the leading lady, Ling, to her two men. Her feelings and emotions are told to us frequently throughout via voice-overs, which add great depth to her character, and make the film far more emotional. 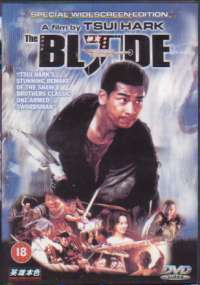 The Blade changes from just being a violent action flick, to a violent action flick with a very strong, sad love story. This is a very welcome change which I think made me really enjoy the film, rather than just thinking it was pretty good. The performances from all the actors and actresses are of a high standard, with their feelings being quite evident just from their body language and facial expressions. It is that sort of feeling that the majority of Hong Kong action films which I've seen are lacking. Most of them are just all action with an ok plot, but little emphasis on powerful character performances. In that department The Blade is a welcome breath of fresh air. That being said, for me what really stands out is the fight choreography. Some of the swordplay on display here is quite simply stunning. There are long takes with the two main fighting characters, Chiu Cheuk and Xiong Xin-Xin, performing sword moves faster than you would believe, with truck loads of bamboo poles being on the receiving end of most of the strikes. What really struck me was the level of skill that must have been involved in performing some of the scenes, particularly the end battle scene where the long line of bamboo poles leaning against the wall are continuously sliced in half by the two characters. So many things could have gone wrong there, yet they still make the scene look spectacular. Granted there was undoubtedly some under-cranking going on, but it is not really that evident. Now I've said that the fight scenes are very worth while, the acting is of a high standard and the overall story is good, so what is it that is wrong with The Blade which stops it from being the epic that it looks as though it was intended to be? Well for me the thing that ruins it in a big way is the direction in places. From having breath taking scenes like the end battle, these are completely counter balanced by very bad direction and camera work in other battle scenes - in particular the rescue scenes, where Cheuk loses his arm. The camera work for a lot of this is so frantic that I had no idea what is going on. It felt like constant subliminal frames were on screen as something flashed by for a fraction of a second. Whether he was trying to capture the hectic and exciting mood of the scene, I do not know, but I do know that whatever he was trying, it did not work. The whole rescue scene, despite being several minutes long, is almost completely wasted due to this bad direction. The frantic camera work is used in other spells too, and unfortunately it also ruins them... If it was not for this, I think the film would be a classic. As it is though, it is just a very good film. The audio for The Blade is a Cantonese soundtrack. The original language... thank god! No dubbed tracks here, which in my books is a bonus. All the words are clear and perfectly audible. There is no fading in or out of the sound, and for my liking I have no complaints. Ling's voice comes across soft and nicely feminine (not too sure what I mean by that. I know the sort of thing I'm trying to say but no idea how to put it into words! ), and as a result is very easy on the ears. The sound effects are good too, with the frequent swishing and clanging of swords sounding very realistic. The subtitles are very good, with one exception. Good things first though... They are a very bold and bright white colour, with a transparent, but darker background, which enables them to be clearly read at all times. There were absolutely no spelling mistakes which I can remember, and gramatically it was pretty much perfect too. On the whole, a very highly commendable production on these subtitles. How accurate a translation they are though, I do not know, as I can't yet speak Cantonese. What I will complain about, though, is their positioning on the screen. 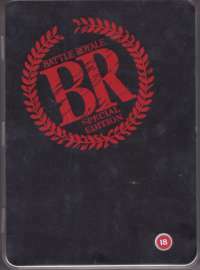 The film is letterboxed, but the subtitles go into the black bit below the film print, meaning widescreen TV owners are not able to make full use of the widescreen ability. If they do, they lose the majority of the subtitles. Hong Kong Classics or whoever is responsible for the subtitles could easily have made them slightly smaller, and fitted them all onto the film print, giving full widescreen compatability. That is my one grudge against the subs. Alas, every film is bound to have a weakness, and I think the picture quality is The Blade's. While there was very little in the way of grain or vertical lines or any sort of flickering, the overall clarity was not using DVD to its capabilities. In honesty the print looked much more like a poor VHS print. Their was not great resolution or clarity to the images. In some films you can clearly see individual strands of hairs on the actor or actresses head, but in this film indivisual strands are pretty much blurred out, with only many strands together being visible - but as a collective not as individuals. All the finer details look somewhat blurred. Also, as is clearly seen in the rescue scene, there is a significant looking amount of colour bleeding, particularly with reds. This makes the blurring appear even worse, and that scene was difficult enough to follow as it was! It really could have been so much better. However, the rain battle scene I thought did look very good. Another downer this bit...A static menu with the 3 following options: Play Movie, Scene Selection and Original Theatrical Trailer. So in other words you are only getting a whole trailer as your extra feature. WOW! Bet you feel priviledged! There must surely have been something that could have been added to this. I read today on Hong Kong Legends web-site that they had recently finished interviewing a whole host of different stars of Hong Kong cinema films so that they could have more extra features on their dvds. From all the HKL dvds which I have seen so far, they clearly realise the difference the little extras make. I'd have a much better feeling of value for money if I bought a film, and it had 2 hours or so more worth of extras, than just having a 3 minute trailer. So MIA and Hong Kong Classics, get your arses in gear and follow HKL's lead! Overall, I will say that The Blade is a very good film. I was captivated throughout and found it a highly enjoyable watch, right from the action through to the plot - as the latter was handled exceptionally well. My only major gripe was the shoddy camera work in places. It is amazing how something like that can damage the overall impression that a film gives, which is a shame as The Blade is a great piece of film. Like I said, I have never seen the Shaw Brother's original, but I would hope that they would be proud of having this as a remake. I'm certainly glad I own it. Just a shame the actual DVD isn't on par with the film.